Why Is Bacon Sometimes Green? Have you ever gone to cook up some bacon, only to throw it away because it's got a weird green color that resembles something out of a sci-fi movie? Turns out that's perfectly normal, and is a result of the preservation process. A chemical called nitrite, which has been used to cure meat for centuries, can react with a naturally occurring blood protein known as myoglobin, which can in turn change the color of the blood pigment in the meat from red to green. A team of researchers in Oklahoma named this phenomenon "nitrite burn." 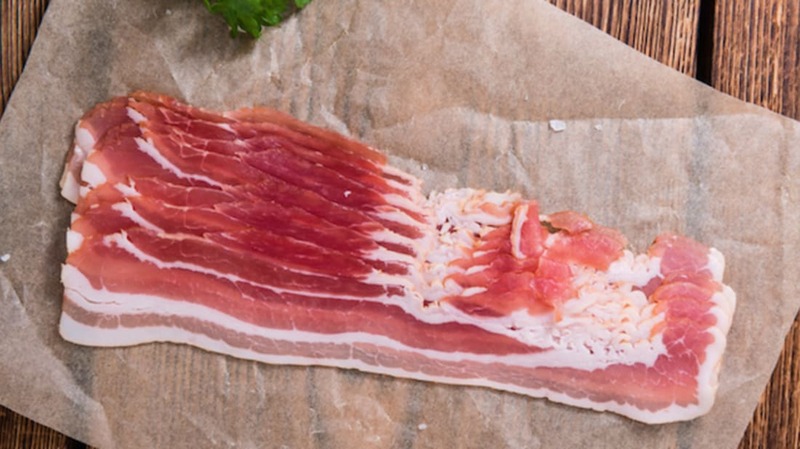 So, in most cases, a light green sheen on your bacon isn't cause for alarm. However, that doesn't mean that consumers shouldn't proceed with caution. In other cases, discolored bacon may indicate that the meat is not fit for consumption. For example, if the bacon has a greyish tinge, or green spotted areas, then it should be thrown away. Bacon should also be thrown away if it feels slimy, or smells even slightly unusual. The basic rule here is that any changes to the bacon's original state probably indicate that it has gone bad. (And by "the bacon's original state," we mean the state it was in when you bought it—not when it had four legs and a curly tail.) However, if the bacon has a slight green sheen when examining it in the shop, then this is most likely harmless, as long as the product is well within its freshness date and properly sealed.